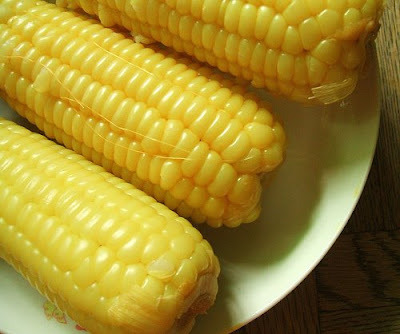 Corn is not my main food here in Southeast China, since our place won't be able to grown them, but I think it's a great and healthy food to fill our stomach when I'm hungery yet don't have enought time to cook. I just put them in the water to boil, don't need any sauce or condiment, I like to eat the nature corn with no extra seasoning or cooking:) So very simple to make. Eat corn on the cob either just as is or seasoned with a little organic butter, olive oil or flaxseed oil, salt and pepper, nutritional yeast or any other herbs or spices you enjoy. Healthy cooked corn with green chilis and onions. Served hot, this makes a wonderful side dish. Enjoy a cold salad with an ancient Incan influence by combining cooked corn kernels, quinoa, tomatoes, green peppers and red kidney beans. Adding corn to soup, whether it chili or chowder, enhances the soup's hardiness, let alone its nutritional profile.